UMass complies with the Town of Amherst plastic bag ban since January 2017, also known as Article 36: Single Use Plastic Bag Ban Prohibition. The campus also offers outdoor event water stations in an effort to reduce single use plastic bottles. A national competition that runs from February 4-March 31 that helps colleges and universities advance campus recycling and waste reduction efforts. 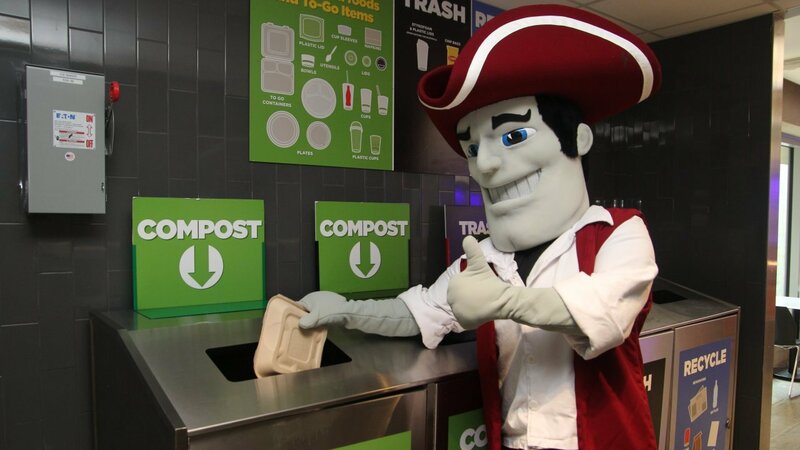 UMass Amherst composts over 1,500 tons of food waste each year making it the largest recycling stream on campus. The university has options to recycle unwanted E-waste. Many of the events on campus are working on ways to reduce their impact on the environment by striving for zero waste. The on-campus Green Office Program encourages and facilitates energy and waste reduction practices. The university uses Single Stream Recycling, which requires that bottles, can, paper, and cardboard all go in one bin. The university is working to reduce paper waste and purchase more sustainable products. The Surplus Property Barn (SPB) acts as a showroom for unwanted but still useable equipment and furniture from all over the campus. Any University department may obtain surplus property for on-campus use. The Office of Waste Management continually tracks the recycling and refuse data for the campus.